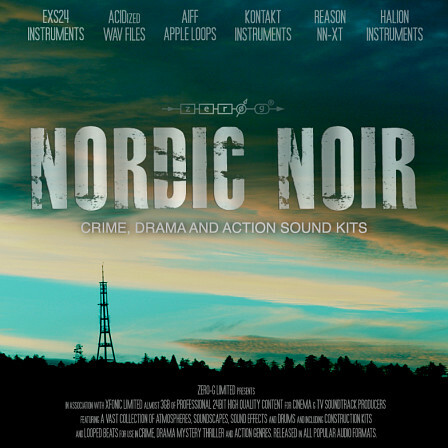 Nordic Noir is a huge new 3Gb Cinematic Crime, Drama & Action sample library from Zero-G based on and calling to mind the great soundtracks from that bleak and beautiful cinematic and TV genre. The sounds from the 32 construction kits have been cleverly created so that they can be interwoven and combined in innumerable ways. There are also extra pads, drumloops, piano and synths. 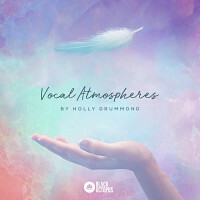 "I wanted to use my experience working with directors, producers and music supervisors for TV and movies to give you a toolbox of sounds to fit any mood and atmosphere. This library has been created predominantly for motion pictures so the audio format is 48KHZ/24bit. The samples work in various tempos and the ability to mute and unmute elements of the construction kits allows for a multitude of variables. You will be surprised how you can alter the mood of your composition just by doing those simple tweaks. Be creative - let this library be a good start for your next blockbuster or award winning TV series." The Following End User License Agreement is included with Nordic Noir. This License is only valid for the individual who has purchased an unopened, new and lawfully made copy of Nordic Noir from a dealer or distributor authorized by Big Fish Audio. "ZERO-G LICENSE AGREEMENT 1. The sound samples included on this product remain the property of Zero-G Limited and are licensed, not sold, to you for use on your sampling software or equipment. 2. A right to use the enclosed sounds is granted to the original end-user of the product (Licensee) and is NOT transferable. 3. The Licensee may modify the sounds. and MAY USE THE SOUNDS FOR COMMERCIAL PURPOSES WITHIN MUSICAL COMPOSITIONS, subject to section 7 below. 4. This license expressly forbids resale, relicensing, or other distribution of these sound samples, either as they exist on the enclosed discs, or any modification thereof. You cannot assign, lease, lend, rent, upload or download to or from any database or server, or transfer any or all of the sound samples to another user, or use them in any competitive product. 5. Licensor will not be responsible if the sound samples do not fit the particular purpose of the Licensee. The sound samples are licensed 'as is' without warranties of any kind. Neither the Licensor, or any distributor of Licensor's products, can be held responsible for any direct, indirect, or consequential loss arising from the use of any sound samples licensed from Zero-G Limited in whatever form. 6. The Licensee may use these sound samples for Foley and sound FX in TV or movie soundtracks, video game soundtracks, gaming machines, or toys, but Licensee may not re-distribute the sounds as sounds, multi-sounds, samples, multi-samples, programs or patches – meaning the Licensee cannot re-sell them as part of a sound sample library of any kind thereby effectively competing against Zero-G. Note also that use of the sound samples in isolation in video game soundtracks, gaming machines, or toys where they appear in isolation or as sound effects as part of a music game or remixing game is not permitted without first obtaining a separate written License (subject to availability) from Licensor. 7. Use of the sound samples in 'library music' (also known as 'music libraries' or 'production music'), which is intended for commercial exploitation by relicensing to multiple third parties, is permitted PROVIDED that the samples are used within a musical context and are not presented isolated or 'solo-ed'. The sound samples must be used 'in combination' within musical compositions. For such usage, any rhythm loop samples (which Zero-G regards as being musical clips in themselves) must also be combined with other types of samples or sounds to effectively form a new composition, rather than simply being looped in isolation."